Ninsei's success lay in his skillful incorporation of pictorial narratives into his ceramics by using overglaze enamels, in effect creating three-dimensional paintings. He also broke new ground by introducing a modern sense of aesthetic value independent of Muromachi tea cultivation. He combined the refined, elegant aesthetic sense of the Kyoto nobility with the taste for rustic, unassuming tea utensils fostered within the warrior culture. Like traditional tea utensils, Ninsei's ceramics bear individual names. By signing his works, his name became a brand name. For 800 years, Kyoto was the imperial capital of Japan. Craft industries of the highest order flourished there, and hopes of royal patronage attracted the finest artists. Even after the political capital shifted to Edo (Tokyo) in 1600, Kyoto remained the cultural capital, and lacquer, textiles, ceramics produced there carried the greatest prestige. A Kyoto trademark guaranteed both recognition and sales. 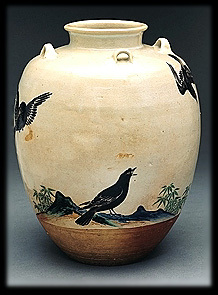 Unlike the commercial Arita kilns--which produced porcelains for high and low, domestic and export markets--Kyoto potters made stonewares in tea ceremony style for domestic consumers. Many Kyoto potters were renowned artists who signed their works. This section displays works of two of the most celebrated, Nonomura Ninsei and his student Ogata Kenzan.